Kenworth drivers rely on quality, dependable trucks—these rigs are known as The World's Best for a reason. More than just transportation, Kenworth trucks are a high-tech mobile office with standard features that exceed the competition. To top it all off, Kenworth big rigs are fully customizable. Kenworth trucks are custom-built to meet your needs. We’ll work with you to determine the exact specs of your new truck based on your loads and lifestyle. 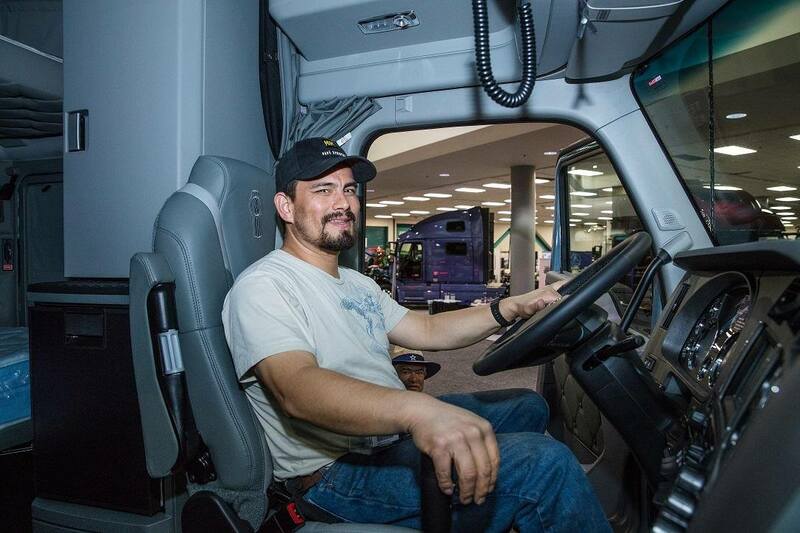 Each Kenworth truck offers different options and upgrades. Let's look at some of the interior options for the T680, one of Kenworth’s most popular long-haul models. The 76 Inch High-Roof Sleeper offers a spacious interior with plenty of room to work, sleep, and relax. Drivers will have all the space they need–even if you opt for accessory add-ons. The 76 Inch Mid-Roof Sleeper is great for drivers who need plenty of room but can handle a roof with a lower-profile. Choose between extra storage space or a folding upper bunk. The 52 Inch Mid-Roof Sleeper can be a smart choice when drivers have routes with a short layover. You can also get this truck with an aerodynamic roof fairing. The 40 Inch Flat-Roof Sleeper is a compact option that still offers drivers a comfortable place to rest their head. Perfect for applications where length and tare weight are at a premium. With the T680, you can choose between two different interior paint colors. The vantage option is a warm tan with brown and neutral trim; diamond is off-white with gray trim. Both choices come with a color palette of four total paints for a modern, luxury design. Dining Table / Workbench: This option allows you space to have dinner or set up a usable workspace. It even features a swivel design so it's accessible from either the passenger seat or the bunk bed. TV Wall Mount: This mounting system holds a flat screen television up to 23 inches and extends and swivels. Upper Storage with Tie-Down: This extra storage unit will hold your microwave safely in its place, even when you’re on the road. Organizer Cubby: This organizer serves a dual purpose as storage space for keys, cell phones, and other personal items, as well as a sturdy hand-hold for safely accessing the upper bunk. Fridge / Freezer: A large-capacity freezer / refrigerator stores food and drink in a drawer-style cabinet, located behind the driver seat and next to the lower bunk. Wardrobe & Cabinet: The large cabinet space can be used for several purposes, and it comes with a removable door for added convenience. The exterior of Kenworth trucks can be highly customized as well. Looking at the T680, drivers can choose custom options including full fairings, partial fairings, or none, as well as painted, in-mold, or chrome bumper options. Have questions on how to finance your new Kenworth? At Papé, we're here to help. Our trusted finance managers work with multiple lenders in each of the regions we serve. We have the knowledge and experience to make this investment as seamless as possible, offering fixed rate loans, TRAC leases, and fair market value. We’re proud to offer semi-truck financing to our valued customers. Browse our current truck inventory today.